Even before Jane’s Carousel was installed in Brooklyn Bridge Park, groups traveled from Ohio to DUMBO to be reunited with the carousel of their childhood, beautifully restored by Jane Walentas. Philadelphia Toboggan Company’s 1922 PTC #61 was originally installed in Youngstown, Ohio’s Idora Park, which closed after a devastating fire. The Walentas’ purchase of the carousel at the park’s 1984 auction kept the ride from being broken up. 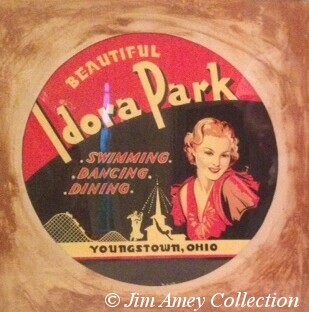 Seeing an ad by Jim Amey on a used ride site seeking ride cars and other Idora Park artifacts for his homegrown museum reminded us of the Ohioans poignant visits. When ATZ contacted Amey, he said the Idora property was still vacant after 30 years and the park’s rides had gone the way of the four winds. I was in my mid 20s and living overseas when Idora Park ‘died.’ I was sad to hear about Idora’s fire and closure, but it took quite a few years before I realized just how much I (and Youngstown) had lost when Idora Park disappeared. I returned to Youngstown in 1993 and my wife and I walked the Idora Park property. It was heartbreaking to see the destruction and decay. I had been to this park so many times as a child and as a teenager. I worked at Idora Park in the Football Throw game and the Skee-Ball game in the summer of 1976 – my last real visit to Idora Park. Now it was gone. I think that walk of ours was when the seed was first planted that I needed to try to preserve whatever parts of Idora Park I could find, to preserve and share the memory of Idora Park. Amey started to find Idora Park ride cars, posters and ephemera through people he met via the message boards at IdoraPark.org. His collection includes one of only three front cars to the Wildcat roller coaster, a rear car to the wooden Jackrabbit roller coaster, a Silver Rocket Ship, a Tilt-A-Whirl car, three Caterpillar cars, the 12-foot-tall metal Nutcracker Soldiers that guarded Kiddieland, the entire Kiddieland train and all of its tracks (seen in the 1952 photo below) and a 6-foot-long Idora Park neon sign. 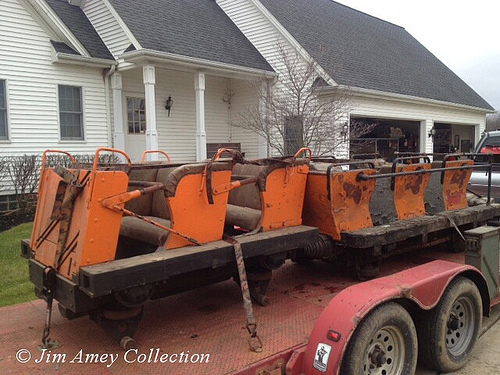 Since Idora Park closed nearly 30 years ago and it is difficult to identify things as being from the park, Amey is also looking for what he calls “Idora Park-Identical, or Idora Park-Like artifacts” including signs, ride parts and games. His email address is jamesamey[AT]aol[DOT]com. Last summer, Washington’s D.C.’s National Pinball Museum invited pinball fans to “come out and play until the flippers fall off” after losing their lease at a Georgetown shopping mall. Now the relocated museum is set to open in downtown Baltimore on January 14. Pinball collector David Silverman’s 12,000-square-foot museum houses a collection of over 100 pinball machines, including a 19th century pinball precursor, vintage woodrail games and modern, solid-state machines. “Education is a big part of the museum,” says Silverman, whose background is in art, education, and landscape design. Over the past 30 years, he has amassed a collection of more than 800 pinball machines. The Museum was founded as a nonprofit organization in 1998. “We have a walk-through exhibit of different types of games, so people can get a sense of pinball’s rich history,” the collector told ATZ. 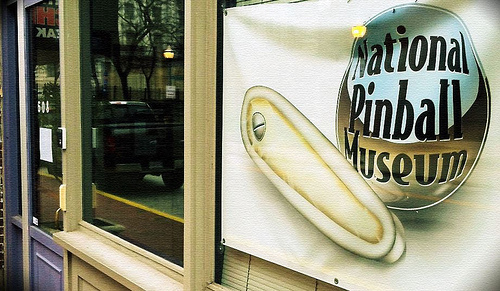 There’s also a “Pinhead Gallery” where visitors can play up to 40 machines. Admission tickets include full access to the exhibits and range from “Special When Lit” with unlimited play for $13 to “Replay” featuring two hours of play. The museum is currently offering 35% off admission and annual passes if purchased by January 13. Regular hours of operation will be posted on the museum’s website and Facebook page.